It is a prayer that resonates with many people in any place or time. We know the frustration of feeling that God is keeping a safe distance, cut off from us on the other side of the gates of heaven, while things are frighteningly out of control here in our world. Drug and alcohol fuelled violence stalks the streets; weather events become more and more extreme as climate change continues apace while authorities meekly capitulate to business demands; fears of nuclear war are again in the news; more and more people can be seen sleeping on the streets as low income housing disappears. “O that you would tear open the heavens and come down!” Come down and take charge and do something about it. The plea is closely related to one of the lines in the Lord’s Prayer: “Your will be done on earth as in heaven.” O that you would tear open the heavens and make your will be done here too. The word that Mark uses when he describes the heavens being torn open or torn apart is a surprisingly vigorous or even violent sounding word. Matthew and Luke use gentler words in their accounts. In English the effect is that they say he saw heaven open up, while Mark says he saw heaven torn open or ripped apart. And so in the gospel account, these two symbolic visions of the tearing open of the curtain of heaven stand as bookends to the ministry of Jesus: the first at his baptism as his ministry is launched, and the second at his death as his work is completed – his work of tearing open the heavens and uniting us with God. But at his baptism, we don’t only see the heavens torn open. There are other signs and they tell us something of how we fit into the story and how we are involved in the tearing open of heaven. The Holy Spirit came down on Jesus, like a dove. It doesn’t say the Spirit was in the form of a dove, or looked like a dove. It just says the Spirit’s descent was like that of a dove. But linking the Spirit’s descent with the reference to a dove is a powerful symbol. It recalls other stories. It recalls the story of Noah for whom the sending out of a dove, and its return with an olive twig in its beak, was a sign of a world made new; a world purged and cleansed beneath the waters, but now rising again as a new creation. And it links back further too, although a little more obscurely, to the beginning of the Genesis creation story that we heard read tonight. In a mysterious description full of ambiguities, the Spirit of God is described as brooding over the waters, over the unformed chaos of the primeval world. And although it doesn’t explicitly use the image of a dove, the word used for the Spirit’s brooding hover is a Hebrew word that is usually used of a bird brooding over its eggs. The Spirit is there as the breath of God, the presence of God, willing the new born earth into existence. The Spirit is there, making all thing new and alive and vibrant with the presence of God. We see the Spirit coming down again in the story we heard from the Acts of the Apostles. Paul comes across a group who had responded to the preaching of John the Baptiser and received his baptism, but there is something missing. John’s message and his baptism were a preparation for something more, a something these disciples have not yet encountered. John himself had said that there was one coming after him who would baptise with the Holy Spirit and fire. 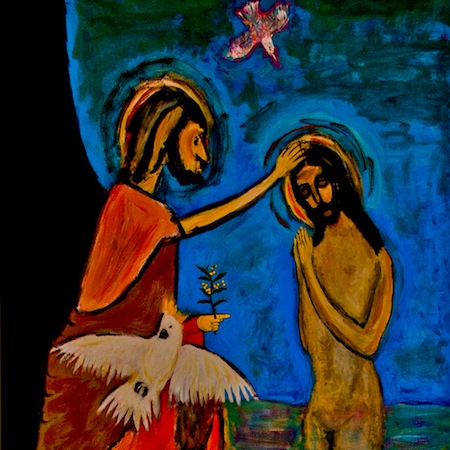 These disciples have responded to the call to prepare the way of the Lord, but it is now, at Paul’s hands, that they discover what they had prepared for and the heavens are torn open and the Holy Spirit comes upon them in baptism and the laying on of hands and their lives are made new. Like the image of the dove, these words too link back to other stories, to other pictures and meanings. These words are a quote from a coronation psalm, a psalm that was used whenever Israel anointed a new king. So when they are used here, the baptism of Jesus becomes also the anointing of a new king. But there is something extraordinary about this anointing of the Messiah King at the hands of John as the heavens are torn open and the Spirit descends. Something is extraordinary in its ordinariness. For when a king is anointed, it is something that is unique to that individual. It is a special anointing with a special oil for a special person. It cannot be shared around. But here, Jesus is anointed king, not with special oil but with ordinary water, and almost anonymously alongside all the people of Jerusalem and Judea who were also coming for baptism at the hands of John. When we affirm that “we are the body of Christ; his Spirit is with us”, we affirm again and again that in Christ, the curtain of heaven has been torn open and the Spirit is making all things new, and that in baptism we too have been anointed as God’s beloved children and sent forth to make God’s love known and to embody the reconciliation of heaven and earth. And as Alison’s beautiful poem below says, our baptism may not have felt like anything so dramatic or wonderful, but somehow it is enough. It is enough. there was no River Jordan. who wanted me to read Tillich first. The heavens stayed resolutely shut. Not even a small bird floated down from the skies.